Decluttering seems to be a constant effort for many. There have been major minimalist movements in an effort to help people let go of unnecessary and burdensome items. 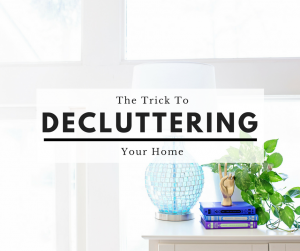 These movements have gained huge followings because of the incredible benefits of decluttering and simplifying your life. You don’t have to take an extreme approach and become a minimalist, but regardless of where you fall on the spectrum of minimalism, there are general decluttering strategies that anyone can use to increase their quality of life. This process starts with an attitude of respect. Every item you possess has its own function, whether practical or sentimental, so it’s important that each has its proper space. You can start to practice clutter-free living by keeping only the most useful and meaningful things. Prioritize what you really need. Think about each object’s purpose and respectfully honor its place in your home. Creating a serene, restful space by paring down items on display. To get started, start with a single space such as a bookcase. Empty it completely then clean, paint, or refresh. When it’s time to place the objects back on the shelves, ask yourself, ‘Do I love it, does it enhance my life, and can I live without it?’ Another strategy is to ask yourself whether you truly like a given object or if you just like the memories that are associated with it. If it’s the latter, and the item serves no aesthetic or useful purpose, revisit those memories, take a photo of the object and put the photos into a scrapbook. Remember, that the memories are the real gift! A helpful rule to live by is one in, one out. For Example, if you purchase a new pair of shoes, be sure to get rid of a pair. The one in, one out rule will help keep clutter down. Have fun and purge, purge, purge!